Christmas Delivery! Our machine quilting turn-around time is looking great! Plus, helpful holiday hints! "His eyes—how they twinkled! his dimples, how merry! Soon gave me to know I had nothing to dread." 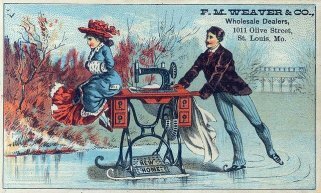 Are you starting to dread the thought of getting to the bottom of your Christmas sewing list? Santa's here with a wink to let you in on a some great hints for wrapping things up early! This jolly old elf will be available as a panel designed by Urban Chiks as part of their Swell Christmas collection for Moda! Simply top-stitch or applique him onto your favorite Christmas background for a quick and easy holiday quilt. We expect panels to arrive here at the shop in early November so keep an eye out for them! They'll dash away, dash away, dash away all - - very quickly! 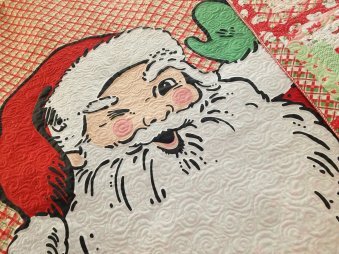 Ramona Sorensen had fun adding some curl to Santa's snowy white beard with some custom machine quilting. Now is the time to bring in your finished quilt tops for Christmas delivery! Our turn-around time is looking great right now - - 1-2 weeks for simple edge-to-edge designs by Tammy or Emily, 3-4 weeks for custom work by Ramona. Our machine quilting service begins at $.015 per sq. in. for simple edge-to-edge designs including stipple and loop designs. $35 minimum applies. More involved edge-to-edge designs start at $.02 per sq. in. Custom designs addressing borders and individual block designs begin at $.03 and go up depending on detail, ruler work or the need to mark designs. Extensive custom work may be charged by the hour. Please bring your quilt into the shop for a consultation and estimate from one of our employees. We can help you choose from one of our many batting types, discuss design options and select thread color. Please make sure that your backing is 4" larger than your quilt top on the top and bottom (8" total) and 3" larger on either side (6" total). All three of our quilters are ready to put on their elf hats and make some magic happen! Ã¢â„¢Â« “Sew it all – Sew it all – Sew it all the way!” Ã¢â„¢Â« Think of this first Sew-It-All event as a Santa’s Workshop where you can bring all your last minute Christmas sewing and, well, SEW-IT-ALL! $65 includes lunch both days so you can sew non-stop at our retreat center. You will also receive a Sew-It-All pass good for exclusive discounts at the shop during the event! Bring any sewing project that needs finishing and Chris & Jen will be there to lend advice and help you trouble shoot. With two whole days dedicated to finishing projects you really can be a Sew-It-All, even during the holidays! Register now in-store or on our website. Show-and-tell – we love to see your finished projects! Add supplies purchased to your Sew-It-All Weekend tab and settle up at the retreat center in one convenient purchase! 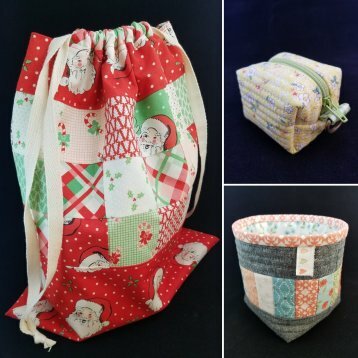 Bags bins and totes make fabulous gifts and offer useful ways to package a holiday treat, gift card or other special surprise. Shelley Taylor will teach three fast and fun bags varying in style and purpose over the course of a week. You won't want to stop! You'll learn some excellent bag-making tips and even get a bit of piecing in! Click here to enjoy a week of bag making fun (3 classes for $60!) to prep for the holidays OR sign up for just one to learn how to make your favorite from the series ($25 per class)! Check our website for a full description and to register. Have you ever considered signing yourself and a friend up for a quilting class or club as a gift? Our Second Wednesday Club would be a gift you could share all year! Our longest running club here at the Corn Wagon, the Second Wednesday Club has it's roots in our earliest days of business 19 years ago. Some of these quilters have been with us since the beginning, others are new members, all are friends with a common love for quilt-making. By participating in a block-of-the-month program, this 12-month club focuses on making a new quilt each year. We took a vote and are excited to announce our project for Second Wednesday 2019! 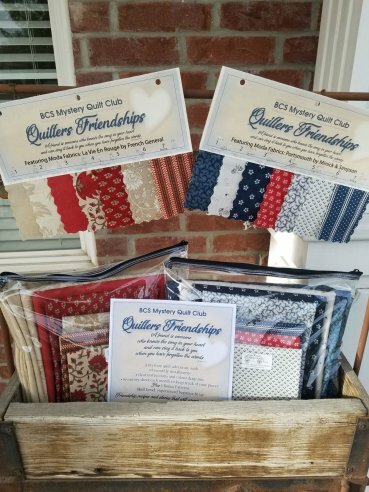 From Border Creek Station comes the Quilter's Friendship Mystery Quilt opportunity! Like years past, we can promise you’ll love the beautiful quilt you will finish through this program. New this year comes the chance to choose between two fabric collections; Portsmouth by Minnick & Simpson or La Vie en Rouge by French General. Reserve your kit and color choice by registering now with a deposit. Purchase your complete fabric kit in full before the first club meeting then join us every second Wednesday beginning January 2019! Class meetings will include block demos, delicious recipes, show-and-tell and lots of fun with quilting friends! Kit Payment Options: Purchase kit in full for $239 + tax OR $120 deposit to reserve color selection with remaining balance due 01/09/19. Please visit or call the shop to register for Second Wednesday Club. 801-491-3551. If you are a club member who has not made your color selection and deposit, please contact the shop right away to ensure you get the colorway of your choice. 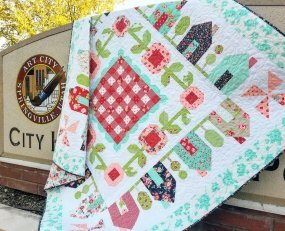 The SPRINGVILLE quilt by Camille Roskelley is absolutely darling and we think the name is especially great. Please join us as we sew Springville together here in Springville, Utah! For full details and a supply list, please visit our website. We still have just a few seats left! Monday, October 29th - 25% off KITS! Doors open at 9:00 a.m. for those registered for this block-of-the-month club. Demos begin at 9:15 and reoccur every 30 minutes. Last demo begins at 12:45. You have one week left to finish up last month's blocks! Be sure to bring them with you next Saturday so that this month's kit can be free! You won't want to miss this month's exclusive specials! Click here for more info on the Saturday Sampler Rules and to follow along each month as blocks are released.